Although Sebastian Vettel admits his Bahrain spin was his own doing, the four-time World Champion has denied cracking under pressure. Vettel was second best to Ferrari newcomer Charles Leclerc throughout the Bahrain Grand Prix weekend and it looked as if it would be more of the same in Sunday’s race. 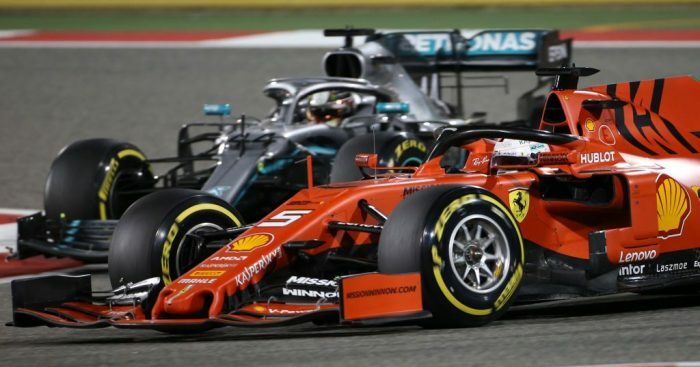 While Leclerc romped off into the distance, holding a comfortable lead over Vettel, the German found himself under attack from Lewis Hamilton. The Brit got the jump on him in the first round of pit stops but it was Vettel who was ahead of the second. That, though, looked set to change as the Mercedes driver found some pace and hunted down Vettel. Challenging him for second place, the Ferrari driver spun his SF90 with the subsequent tyre damage costing him his front wing. “Sorry guys, it was my mistake,” Vettel said on the team radio. It was the latest mistake in what is becoming an all too familiar picture for Vettel, who last year carried much of the blame for failing to win the World title. He, however, has denied cracking under pressure. “To be honest, I don’t think it has anything to do with pressure,” he said after the race. “Obviously, when I was fighting with Lewis, the target was to stay ahead and that was the ambition. I got surprised when I lost the rear that suddenly, and then when I was in the spin it was already too late. “Certainly I had a look at it again, certainly it was my mistake and I need to digest that our race could have been a bit better without that spin at that time, but nevertheless it was a difficult race and there is plenty of homework on my side this weekend not having the feel for the car, especially yesterday and today, so we need to have a good look. “From a team’s point of view it was a good step forward from two weeks ago. Plenty of reason to look forward, and generally I am looking forward.